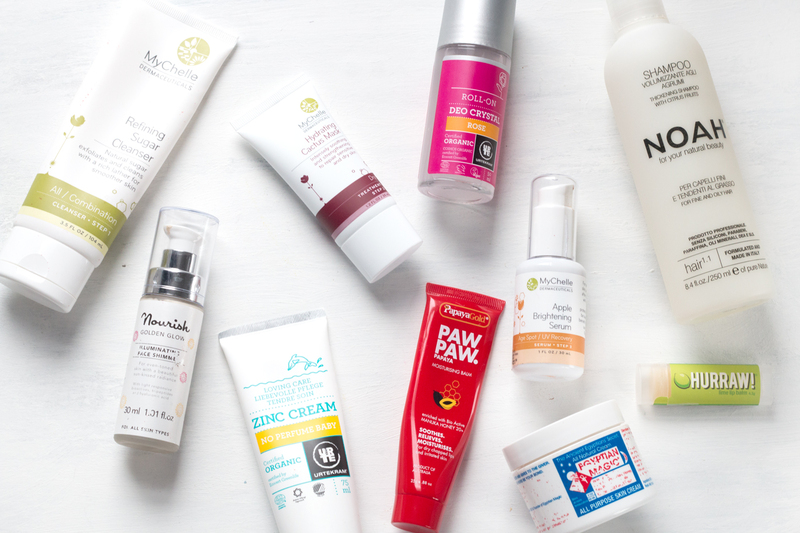 Beauty junkies rejoice, I’ve managed to narrow down some of my favourite natural products into one photo – whether I can breeze through the descriptions and love for each and everyone of them (including the ones not photographed) is another story. Ah, the tales of a beauty addict. My routine is 90-95% natural these days, partly because my healthy lifestyle makes me want to focus on my skin more by treating it with the right products, and partly because it’s just so gosh darn good you don’t want to put anything else on your face ever. I just kind of fell into natural skincare, after years of chemical and clinical products, acne outbreaks both past and recent (more on that another time), and through connecting with brands through my blog, and I’m so glad I fell into the right…hole? Niche would probably sound better here, sorry if you’re reading family members. So what do I love most? What brands make me want to stock up for eternity? And what makes me want to get up extra early in the morning just so I can spend time cleansing my face for long periods of time? The one that started it all, and probably my all-time favourite natural skincare brand as everything I’ve tried works and just makes me want to wash my face five times a day. Every step in my routine is practically covered by MyChelle, so if you’re looking to try vegan, cruelty-free, totally awesome skincare, just do me a favour and try MyChelle – you won’t regret it. Oh surprise surprise, it’s Egyptian Magic, as if I don’t mention it enough (my Mum actually peered over me editing the photo for this post and said “haven’t you already talked about all these products?” Yes, but not enough). Made up of six ingredients including Bee Propolis, Bee Pollen, Olive Oil and Honey, this balmy yet oily goodness works wonders on any skin depending how much you use to cover your face, and it heals so many skin issues – brilliant for a breakout or even a burn from your straighteners, oh you multi-purpose love you. This is a very new find but the brand has swiftly become a staple in my routine. I first discovered Urketram at NOPE 2015 and since trialling a few of the products I’ve become hooked, Scandinavia knows it’s natural skincare, and since adding it in my skin has accepted the newness with open arms and even the deodorant has me converted – freshness all day every day, thank you Urketram! I’m so glad I finally got into this range after fawning over them for ages on loads of blogs, and they certainly don’t disappoint – even after only trying two products from the whole range, I’m pretty adamant they are the best. Most of Nourish‘s products are 80% organic and higher, and I’ve been eyeing up the new Kale range with great big heart eyes as it smells and sounds incredible. Can’t do a beauty post without talking about hair can I, and as you probably know very well I am loving the newly launched NOAH Haircare range at the moment. The fresh and natural smell just makes my hair feel revitalised, and the fact it’s all highly organic and natural based products means no chemicals will harm your scalp or your precious locks. Win win if you ask me! Natural lip products is something I totally get on board with for a luscious, nourished pout, and my two favourites are used to death every day and night – firstly Hurraw! Lip Balms* feel and taste amazing (okay, I don’t eat them, but for each flavour you try, you get the exact natural smell to it that you would IRL) and the Lime flavour is just so refreshing I don’t want to try anything else. For an overnight moisture boost, I love to slather on Papaya Gold Paw Paw*, which due to it’s high Manuka Honey properties helps boost moisture, heal and nourish your lips and in the morning, you still have a nice balm on your lips that feels super soft and gentle. If you hadn’t considered natural beauty before, you certainly should be now as there are so many great products (some I haven’t even mentioned here yet as there’s too many to count) that can make your skin feel amazing whilst keeping it in the balance. Whether you have or currently suffered with a skin issue, or just want to find something a bit more friendly for your face to drink up, there’s a whole world of natural beauty waiting for you. Are you a fan of natural beauty and skincare? Have you tried any of these brands? What are your favourite natural skin products to use?